ADVANCED REVIEW: Could the vampire comic Dark Red #1 have the smartest things to say about a divided America? Dark Red #1 is out 3/20/2019. 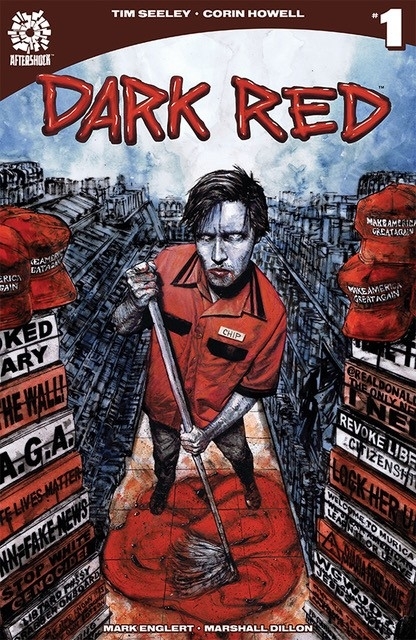 By Zack Quaintance — Dark Red—perhaps because of its name—is somewhat being billed as a political comic, a vampire thrown into the middle of rural Trump America, and to some extent, it’s definitely that. It starts off with the hero of this story working the all-night shift in a gas station. Chip is getting close to quitting time, which is high stakes for him seeing as he has to get home by sun up. This is (of course) complicated by a couple of drunks, rowdy truck drivers, one who rants like a right wing troll on Twitter and another who wets himself and forces Chip to clean it up. Our story is off to the races from there, focusing heavily on Chip, his lifestyle, and the misery of living in a dying small town. The worst case scenario for a comic like this is that it becomes an exercise in one-sided, look how dumb and small and hateful and problematic these people are, a narrative that makes a good number of its characters part of some us vs. them cultural conflict. Dark Red gets close at times but doesn’t entirely do that. Aside from the one truck driver at the start, the handful of characters we do see in this first issue are well-realized people motivated by simple things: the manager who wants the job done, the other truck driver who is embarrassed he couldn’t get to the bathroom in time, the woman who has a rare disease that makes her generate too much blood, thereby putting her at risk for clots and making her a great friend for a vampire. As a result, the central conflict of this comic is not so much us vs. them (a narrative you can find plenty of places these days, often well-executed and poignant), as it is man vs. the place he’s stuck living. That’s a really important distinction. There’s a lot of setup that has to be done in this first issue, and so we only get a hint of it. It is, however, tantalizing. It occurred to me while reading this comic that we haven’t really had a defining story of what it feels like to be a good person from small town America, at least not since things like the changing economy, globalization, and the opioid crisis rendered those places thoroughly desolate and hardscrabble. Most great books, films, comics, songs...you name it...that take on the big city vs. small town divide are from other eras, casting it as a question of excitement vs. boredom, a matter of mostly deliberate choice. Sometimes it has to do with opportunity, but these days that whole conflict has perhaps evolved into something more severe, becoming a question of survival. And what better hero to have for a story about survival than a schlubby vampire who works in a convenience store, lives in a trailer, and needs human blood to get by? Okay, maybe there is a better character than that, but this is comics, a medium built upon genre extremes, and in that context, I can’t really think of one better. Chip the truck stop vampire is a guy who lives in rural America because the city is too much for him, too intimidating, and he has a passable thing figured out here. There’s some real potential in that. Writer Tim Seely, artist Corin Howell, and letterer Marshall Dillon have hit on a concept that might just use vampires to deliver thought-provoking nuance (I know how that sounds but stick with me…). In Dark Red #1, they work hard to set that up amid the normal debut issue trappings, the interesting opening and enticing cliffhanger. The real success of the book, obviously, will hinge on what they do later on via the execution. I don’t envy the inherent challenge this concept invites. It’s audacious, to be sure, but fortune favors the bold, in creativity as in many things in life, and from the start, a comic about a vampire in deep red America has been a pretty bold undertaking.